As a birthday gift to herself, my wife got a pair of Keen shoes that she’s had her eye on for about a year. She talked about how great Keens are. 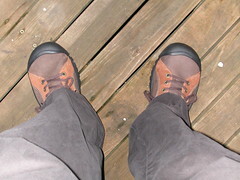 The salesguy talked about how great Keens are. They’re feather-light, they’re comfortable, they’re water-resistant – pretty much the perfect Seattle shoe. And all the while, my feet were hurting from the walking around we’d been doing. “So, uh, do you have any of these for men?” I finally said. I now own Keens. I’ve since learned that they’re very trendy at the moment. And yes, they are light and comfortable. I also like the wide, round toe which makes my feet look like a 1930s cartoon laborer’s. ← Alex Cox on the erosion of "fair use"